Staggered by the volume of demand for the 'A' Model, Innocenti soon realised that the market would demand a more sophisticated machine, thus the 'B' was born. The 'A' was a good base to start with economy - simplicity - reliability - but the concept just needed refining. Launched in November 1948, on face value the 'B' Model appeared to be no more than a cosmetic face lift of the 'A'. It was much more than this though, Innocenti had learned from the Model A and the Model B featured some refinements; most importantly improved suspension. This came in the shape of a coil spring damper mounted horizontally under the engine and a knuckle joint with spring suspension at the rear, with the front suspension being spring suspension in the front forks. So although the front part of the engine was rigid the back could now pivot. Tyre sizes were increased from the Model A's 3.50*7 to larger 3.50*8 which also helped improve the ride quality. The handle bars were moved forward also for a for a more comfortable riding position, and the gear change was made easier with a handlebar mounted twist grip which on the Model B utilised a teleflex system, which of course meant that the leg shield mounted gear indicator as found on the A model was no longer needed. The handle bar gear change was a feature that would now become standard on all subsequent Lambrettas. All control cables were now moved outside of the frame to allow ease of maintenance. 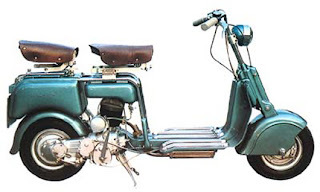 The frame was again a central tubular item with chrome double tubes bent around the petrol tank and over the engine (thus supporting both the driver and pillion seats), but was raised a but higher to improve the riding position. The height gain in the chrome tubes allowed a larger capacity fuel tank to be fitted giving more range to the rider. The Model B gained other such luxuries as a leg shield mounted speedo, which was driven by a cog on the front hub. Again as with the A, the B model had some mid production design changes with the development of the model because Innocenti were not afraid of change. 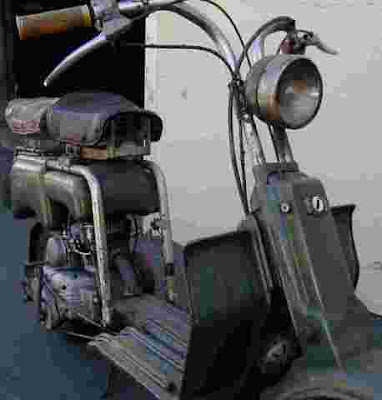 First version had a seperate horn button mounted on the handle bars, with the light switch on top of the headlight. 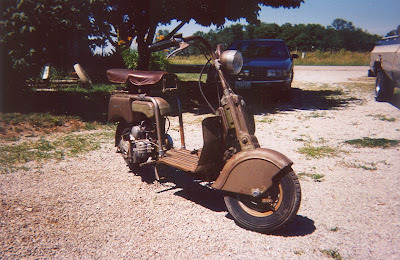 Later models saw the horn button integral with the light switch, which was then mounted on the handle bars as one unit. To start with the rear brake pedal was on the left hand side to the rear of the floor boards. This was then switched to the front right hand side, another feature that would remain with Lambretta throughout its model range. Finally on the last versions of the Model B, the brakes were upgraded or change to the use of brake shoes. Again as well as improving braking performance, it also meant that should the brakes need changing, the job was fairly small and easy to do, compared with changing or re lining the complete front or rear hub as on earlier versions. 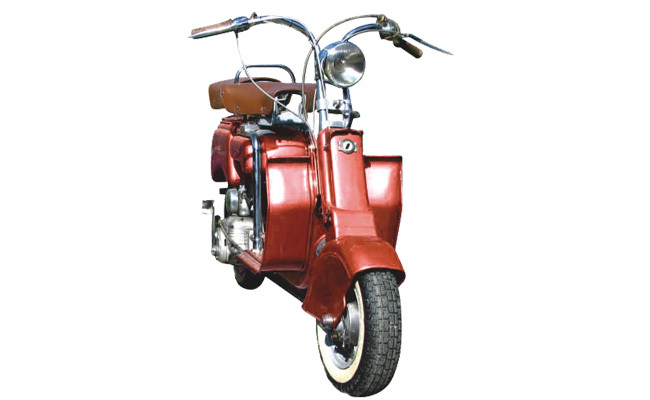 By the end of its production run in January 1950 a total of 35,014 Model B's had been produced. Paint colours for the Model B were all metallic and the customer had the choice of: blue, red, green or beige. A gold Lambretta sticker was affixed to the rear toolbox and an Innocenti badge was fixed to the front fork stem. sufficient for me. Personally, if all website owners and bloggers made just right content as you probably did, the internet might be much more useful than ever before.